With a release date now set for Joaquin Phoenix’s “Joker,” the cast is starting to take form as “Deadpool 2” star Zazie Beetz is in talks to join the cast, according to an individual with knowledge of the project. Beetz is said to be in talks to play a single mother who catches the attention of the Joker prior to his transformation into the nihilistic Gotham City villain. In Moore’s version of the Joker’s origins, the villain was an unnamed failed comedian who struggles to make ends meet for his pregnant wife. When his wife is killed in a freak accident and a robbery he is forced to take part in disfigures his face, the comedian snaps, becoming the infamous Joker. Warner Bros. and Village Roadshow will co-produce the film, with Todd Phillips directing. Emma Tillinger Koskoff and Richard Baratta, whose producing credits include Martin Scorsese’s “The Wolf of Wall Street,” are attached as producers. The film will be released on October 4, 2019, with production set to begin in New York in September. Beetz is also set to star in Season 3 of the hit FX show “Atlanta” as well as Steven Soderbergh’s next film, “High Flying Bird.” She is repped by The Gersh Agency. Since Comic-Con is a hotbed of superfans, stars like to go into stealth mode in order to experience the fun. 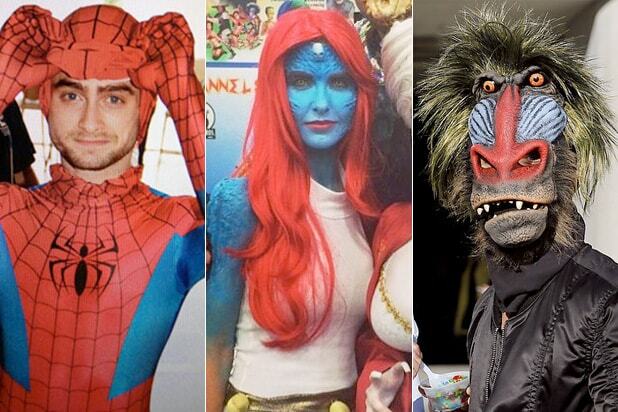 See the celebrities who have walked in disguise at the annual fan fete in San Diego, California. In 2018, Mark Hamill hid among fans on the convention floor disguised as a First Order stormtrooper. nd yes, he joked about Leia’s infamous “Aren’t you a little short for a stormtrooper?” line in his Instagram post. When she wasn't promoting "Black Panther" in Hall H, Lupita Nyong'o went running around the convention floor in a Pink Ranger outfit at Comic-Con 2017. In 2011, Esquire magazine writer Chris Jones accompanied Justin Timberlake at Comic-Con dressed as beloved "Sesame Street" duo Bert and Ernie, respectively. While attending 2011's Comic-Con to promote "The Amazing Spider-Man," Andrew Garfield pulled a double-fake by dressing as... Spider-Man. Former "Doctor Who" star Matt Smith put on a Bart Simpson mask to walk the floor at the 2013 event. Bryan Cranston surprised his co-stars at a "Breaking Bad" panel in 2013 with a creepily realistic Walter White mask. Former Harry Potter star Daniel Radcliffe left his invisibility cloak at home and donned a Spider-Man costume to attend the 2014 Comic-Con. "Batman" star Ben Affleck avoided Batman questions in 2017 by walking around the convention floor in a Sesame Street shirt and a hideous green mask. In 2014, "Lord of the Rings" director Peter Jackson posted pics of himself on Facebook strolling through San Diego as an evil jester. Jack Black walked the floor of the 2014 event wearing a Stormtrooper mask but admitted that he didn't fool many people. "Everybody's just like, 'Jack Black, you in there?'" he told MTV News. "And I'm like 'No, it's not me. I don't know what you're talking about.'" Samuel L. Jackson mysteriously tweeted this bemasked shot of himself with his castmates from "Kingsman: The Secret Service" in 2014. According to science blogger Phil Plait, "Mythbusters" host Adam Savage built this elaborate costume for the 2014 event. Former "Hills" star Audrina Patridge went blue as the X-Men character Mystique at the 2014 convention. Simon Pegg put a "Star Wars" mask on top of his "Shaun of the Dead" outfit for the 2014 Comic-Con. "Game of Thrones" actress Maisie Williams went all out for the 2014 convention, putting on both a Spider-Man mask as well as a Guy Fawkes disguise. Marvel star Mark Ruffalo pulled on this creepy mask to wander Comic-Con in 2015. While there were plenty of fans who dressed as Jared Leto's green-haired Joker at the 2015 Comic-Con, the "Suicide Squad" star himself went undercover in a baboon mask. "He had no idea. :)" the star wrote in his Instagram caption. Josh Hutcherson even surprised his "Hunger Games" co-star Jennifer Lawrence with this old-man mask at the 2015 Comic-Con. Big-screen Superman Henry Cavill put on a Guy Fawkes mask and walked the convention floor in 2016 -- and even fooled Will Smith and other stars of DC Comics' "Suicide Squad."